The effects of distinct UV-A and UV-B radiations were studied on etiolated pea (Pisum sativum L.) epicotyls. Emission spectra of the native protochlorophyll and protochlorophyllide forms were measured when epicotyls were excited with 360 or 300 nm light. The UV-A (360 nm) excited mainly the non-enzyme-bound monomers of protochlorophyll and protochlorophyllide and the UV-B (300 nm) excited preferentially the flash-photoactive protochlorophyllide complexes. These latter complexes converted into short- and long-wavelength chlorophyllide forms at 10-s illumination with both wavelength irradiations. As the spectral changes were very small, the effects of longer illumination periods were studied. Room temperature fluorescence emission spectra were measured from the same epicotyl spots before and after irradiation with various wavelengths between 280 and 360 nm for 15 min and the “illuminated” minus “dark” difference spectra were calculated. Both the UV-A and the UV-B irradiations caused photoreduction of protochlorophyllide into chlorophyllide. At 10 µmol photons m−2 s−1, the photoreduction rates were similar, however, at 60 µmol photons m−2 s−1, the UV-B irradiation was more effective in inducing chlorophyllide formation than the UV-A. The action spectra of protochlorophyllide plus protochlorophyll loss and chlorophyllide production showed that the radiation around 290 nm was the most effective in provoking protochlorophyllide photoreduction and the UV light above 320 nm caused strong bleaching. 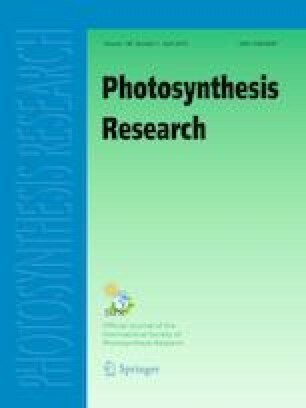 These results show that the effect of the UV radiation should be considered when discussing the protochlorophyllide–chlorophyllide photoreduction during germination and as a part of the regeneration of the photosynthetic apparatus proceeding in the daily run of photosynthesis. The online version of this article ( https://doi.org/10.1007/s11120-018-0584-y) contains supplementary material, which is available to authorized users. We are grateful to Éva Hideg and Gyula Czégény (University of Pécs, Hungary) for their contribution to the UV photon flux density measurements.